Linda Morris at the Sidney Morning Herald offers a piece on the continuation novels of famous characters created by authors who passed on. Agatha Christie detested her fictional detective Hercule Poirot. In her words, Poirot was "a bombastic, tiresome, egocentric little creep", and so in the 1940s she bumped the fussy Belgian off, writing Curtain, Poirot's final case. Christie was eventually overruled by an adoring public and her publishers and the novel was kept in a bank vault, where it remained unpublished until shortly before her death in 1976. And that, in the ordinary course of a literary life, should have been the end of it. Except that Christie's canny literary estate, chaired by her only grandchild, Mathew Prichard, has assented to Poirot's exhumation in a new mystery authored by the British crime writer and poet, Sophie Hannah. 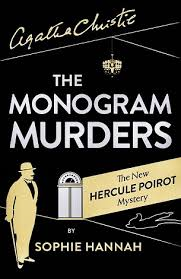 The Monogram Murders adds another title to the ample Christie legacy of 33 Poirot novels, one play and more than 50 stories. In accepting the commission, Hannah walks in the eminent footsteps of Sebastian Faulks (Devil May Care and Jeeves and the Wedding Bells), Val McDermid (Northanger Abbey), Alexander McCall Smith (Emma), William Boyd (Solo), Jeffrey Deaver (Carte Blanche) and the Booker Prize winner John Banville (The Black-Eyed Blonde), all feted novelists who have joined publishing's current obsession with literary resurrections. It is an easy sell, the pairing of international writers to literary classics. New books bring bankable royalties for the deceased's literary estates, and in theory, adds to the material engagement of younger readers with the classics. Note: Like Agatha Christie, Sir Arthur Conan Doyle and Ian Fleming killed off their popular characters, but both later resurrected their characters due to popular demand. In which book did Bond die? I don't remember that. As for "Christie was eventually overruled by an adoring public and her publishers and the novel was kept in a bank vault, where it remained unpublished until shortly before her death in 1976," that's not true. The public never knew about "Curtain," so they couldn't have "overruled" it. Nobody outside her immediate family knew about the book until it was released (she wrote another "trunk novel" featuring Miss Marple that was released after her death, but she lives in that one. Make of that what you will. Throughout her life, Christie was worried about leaving her husband and daughter bereft should she die, so she wrote these as kind of an insurance policy. Ian Fleming killed James Bond off in "From Russia With Love." He died from a kick from Rosa Kleb's poison blade in her shoe. Fleming said he was tired of his character, but after some pressure, he brought Bond back to life in the novel "Dr No." Thanks for the info on Christie's "trunk novel."